Aging and Adult Services—General information. Civil Service/Employment—Information about Civil Service jobs and exams. Elder Abuse—Promoting respect, integrity and dignity in elders. Election Inspectors—Getting involved in the local political process. Health Insurance for Adults—Medigap policies (including Medicare Part B). Transportation—Information about bridges, traffic signals, programs and highway operations. Q. What do I look for in choosing a nursing home for my parent? Location is usually a factor for most families. Atmosphere: Are bright colors used, natural lighting, seasonal decorations? Personnel: Does there seem to be a good rapport between aides and residents (i.e., gentle persuasion and bantering)? Q. Am I financially responsible for my parents? No, you have no legal obligation to pay parents’ bills or for their care in a nursing home or other facility. Q. What legal matters do I need to be aware of in dealing with my parents? It is essential that older persons grant a Power of Attorney to a relative or lawyer, or close friend if there are no relatives. This should be done through an attorney. Everyone over the age of 18 should have a Health Care Proxy. The Health Care Proxy is currently the only legal form in New York State for the designation of a patient’s wishes, when the patient is unable to speak for him/herself and/or has no hope of survival. This document SHOULD CONTAIN A SPECIFIC STATEMENT CONCERNING THE PATIENT’S WISHES REGARDING ARTIFICIAL NUTRITION THROUGH A FEEDING TUBE AND HYDRATION THROUGH AN IV TUBE. This does not need to be done through a lawyer, nor does it need to be notarized in order to be legal. Q. Who pays for nursing home care? Nursing homes expect that the patient will pay for his/her own care. Only in very rare cases will Medicare pay for the nursing home and then, only partially for up to 100 days. Medicaid will pay when the patient runs out of money. There are financial provisions made for a spouse remaining at home while the other is on Medicaid in the nursing home, so that the at-home spouse will not be impoverished. Q. What alternative senior housing situations are available for Monroe County? Subsidized apartments for low income seniors. Most of these charge 30% of income as rent. Apartments for seniors with rents from $500-$900/month. Senior Retirement Apartments, most of which are related to Assisted Living Facilities and Nursing Homes. These apartments have rents beginning at about $1,100–$3,400 per month. Adult Homes/Assisted Living - all meals, laundry,housekeeping services provided as well as activities. Costs range from $2,000–$3,500/month. Skilled Nursing Facilities with costs ranging from $4,000–$6,500/month. For printed information on different types of housing situations,please call Eldersource at 585 325-2800; 8:30 a.m. until 5:00 p.m. (Monday through Friday). Q. Will Medicaid take my home if my husband goes into the nursing home? As long as the spouse continues to live in the homestead, Medicaid will not take the home. Please click here for FAQs regarding the airport. Q. Why do you use “You’re” instead of “Your” in your slogan: “You’re Right to Vote”? Our hope is that both meanings will be implied by the one sentence. The sentence as written is a commending or urging of people to vote but as a pun it also underscores that voting is a civil privilege and duty, guaranteed under our laws. We wish to affirm both meanings. Q. Do I have to register every year? No. Once you register, you are permanently registered. Name, address or party enrollment changes can be made by submitting a new registration application. If you move, you must notify the Board of Elections within 25 days by re-registering. Q. If I register to vote, will I be called for jury duty? Jurors are drawn from lists of state taxpayers and licensed drivers as well as from voter registration rolls. Do not give up your right to vote in the hope that you will avoid jury duty. Chances are, if you pay taxes or drive a car, you will still be called. Q. What do I need to bring when I go to vote? You do not need identification or a card from the Board of Elections in order to vote, however, we recommend that you bring your driver’s license in case inspectors need to verify identification when a voters signature is not on file for any reason or to verify a change in your name. Q. What if I speak little or no English? Election districts having a 5% or greater Hispanic population are furnished with materials and information in both English and Spanish. At present, there are 63 polling sites that required a Spanish interpreter. The Commissioners continue to recruit interpreters from within the community as well as utilizing students from area colleges. Q. What if I am not permitted to vote? If you are not on the poll-list, it may be because your registration form was not received or, for a primary, because you aren’t enrolled in a party. If you believe that you are eligible, you can still vote. Ask for an affidavit ballot, which is basically a paper ballot. After the election, the Board of Elections will check its records and your vote will be counted if you are indeed eligible to vote. If not, you will receive notice that you are not eligible, along with a registration application for future elections. Q. How can I reduce the risk from combustion gases? The most important practice is to keep all combustion equipment well maintained and inspected for safety. Experts recommend having your combustion heating system inspected by a trained professional every year. Look for blocked openings to flues and chimneys, cracked or disconnected flue pipe, sooty air filter, rust or cracks in the heat exchanger, soot or creosote build-up, and exhaust or gas odors. Always operate combustion equipment for its intended purpose and make sure that it has been installed correctly. Never use unvented combustion appliances indoors without following manufacturer’s recommendations. Q. How can I determine if combustion gases are affecting my health? They may be the culprits if you feel bad only when you’re inside the home and the symptoms disappear when you leave or if more than one person in the home has similar symptoms.A noticeable increase in moisture, like excessive condensation on windows, can also be a sign. Remember carbon monoxide related symptoms are similar to those of flu. Carbon monoxide detectors can be purchased and installed to alert you to dangerous levels. The detector must be properly located according to directions and maintained to assure accurate sensing. However such a detector will not detect other combustion by-products that can still make you ill.
Q. How do combustion pollutants get into the home? Combustion pollutants enter the home from a variety of sources. Any heating appliance that burns fuels—furnaces, boilers, water heaters, fireplaces, stoves, space heaters, ranges and clothes dryers—may introduce combustion gases. These pollutants are also produced by tobacco smoking, burning of candles, automobile exhaust entering from a garage, and activities involved in the use of the internal combustion engines, burning, welding or soldering. Combustion gases and particles also come from chimneys and flues that are improperly installed or maintained and from cracks in furnace heat exchangers. Pollutants from fireplaces and wood stoves with no dedicated outdoor air supply can be back-drafted from the chimney into the living space, particularly in weatherized homes. Carbon monoxide buildup can occur several ways: when flues or chimneys become blocked so exhaust can not be vented to the outside; when a fuel burning furnace has a cracked or rusted heat exchanger allowing combustion gases into the living spaces; when fuel-burning space heaters, ovens, ranges or grills are operated in the home without adequate ventilation; when a car exhaust from an attached garage enters the home; when combustion equipment is not working properly and causes incomplete combustion; and when there is negative pressure balance between the inside and outside of the home that prevents adequate venting of combustion gases. “Backdrafting” can be a problem. It occurs when the air pressure inside the home is less than the air pressure outside, causing combustion by-products to spill back into the room rather than being vented outside. It can also occur when natural draft appliance exhaust is pulled back into the house by mechanical ventilation –like the use of a kitchen or bathroom exhaust fan. Q. Why should I be concerned about combustion pollutants? Carbon monoxide, an odorless gas can be fatal. Nitrogen oxides can damage the respiratory tract and sulfur dioxide can irritate the eyes, nose and respiratory tract. Smoke and other particulate irritate the eyes, nose and throat and may cause lung cancer. Too much water vapor can lead to moisture problems in the home, including the growth of mold. Carbon Monoxide is a colorless, odorless gas that interferes with the delivery of oxygen throughout the body. At high concentrations it can impair judgement, cause paralysis or coma, and death. Lower concentrations can cause a range of symptoms from headache, dizziness, weakness, nausea, muscle ache, confusion and disorientation, to fatigue in healthy people and episodes of increased chest pain in people with chronic heart disease. The symptoms of carbon monoxide poisoning are sometimes confused with flu or food poisoning. Fetuses, infants, elderly people and people with anemia or with a history of heart or respiratory disease can be especially sensitive. Nitrogen Dioxide is a colorless, odorless gas that irritates the mucous membranes in the eye, nose, and throat and causes shortness of breath after exposure to high concentrations. There is evidence that high concentrations or continued exposure to low levels increase the risk of respiratory infection and that repeated exposures to elevated levels may lead, or contribute to the development of lung disease such as emphysema. People at particular risk from exposure include children and individuals with asthma or other respiratory diseases. Particles, released when fuels are incompletely burned, can lodge in the lungs and irritate or damage lung tissue. A number of pollutants, which can cause cancer, attach to small particles that are inhaled and then carried deep into the lung. Q. What are combustion pollutants? They include gases or particles that come from the burning of fuels—natural gas, propane, wood, oil, gasoline, kerosene and coal. The resulting harmful gases include carbon monoxide, nitrogen oxides, sulfur dioxide, acid aerosols, particulate and excess water vapor. Crime Stoppers. Blow the Whistle On Crime! Q. What is Crime Stoppers? Crime Stoppers is a non-profit program relying on cooperation between the Police Department, news media, and citizens of Monroe County. Crime Stoppers encourages people to call the Police Department with information to solve ANY crimes already committed or those about to occur. Rewards of up to $5,000 are available to callers if the information they supply results in an arrest and indictment of a criminal. In July 1976 in Albuquerque, New Mexico, a university student was killed during a gas station robbery. After six weeks of investigation the police had very few leads in the case. Police Detective Greg MacAleese thought that if the people were able to observe a re-enactment of the crime on television, this might lead to someone providing valuable information. Greg MacAleese was right. A caller contacted the Police Department the next day after seeing the re-enactment. The tip information was enough to lead the police to the two men who were responsible. Within 72 hours of the re-enactment being aired, the police had solved the murder. This was the beginning of Crime Stoppers. Since the program started in 1976, there are now more than 950 Crime Stoppers programs worldwide. More than 425,000 crimes have been solved since its inception and over $2.9 billion worth of stolen property and narcotics has been seized. Locally, the Rochester Crime Stoppers program also has been very successful. In the past four years, more than 1,880 calls were made to the hotline, and the information from those calls resulted in 361 arrests. Q. How does Crime Stoppers work? The Crime Stoppers tip line is manned by trained police personnel who receive, process, and pass on tip information to investigating officers. Callers are given a code number, which is used in all subsequent calls, and callers do not have to identify themselves. A reward of up to $5,000 is offered to anyone providing information that leads to an arrest and indictment for a crime. Rewards may also be made for information leading to the recovery of stolen property, the seizure of illegal drugs or an arrest on an outstanding warrant. Q. Who runs the Crime Stoppers program? Crime Stoppers is governed and administered by a volunteer Board of Directors, a group of local business and professional people concerned with the safety of our community. Crime Stoppers is a non-profit corporation and is responsible for raising funds and the disbursements of rewards. The Board of Directors works in close cooperation with the Police Department and all areas of the media. Q. What does it cost? How is the Crime Stoppers program funded? Crime Stoppers is very cost-effective. It’s a Community Project supported by donations of money, goods, and services. Contributions from individuals, private sources, corporations, clubs, professional associations, retailers, and civic and social groups keep the Crime Stoppers program up and running. All donations to Crime Stoppers are tax-deductible. Q. Who benefits from Crime Stoppers? We all do. When citizens become involved in policing their community and make a strong contribution in solving crime, Monroe County becomes a better place to live. Q. Once my company is on the county’s bidders list, will I automatically receive all appropriate specifications by mail? No, Monroe County has an extensive bidders list for most material groups. A reasonable number of specifications are mailed to bidders who bid the material group previously or suggested vendor listings from the county end users. A list of current bids available is listed on the upcoming bids portion of our website. We also advertise each Friday in the Rochester Business Journal and the Daily Record. Q. How do I go about contacting end users in County departments to make them aware of my product line or services I provide? Vendors may contact the general numbers of the departments listed on the Monroe County website and ask the receptionist to direct them to the appropriate person responsible for purchasing that particular product or service. Q. How can I get my company on the county’s bidder’s list? Your company will be added to the county’s vendor database by completing the New Vendor Registration Form (324k PDF) available on our website. Your application communicates to the Purchasing Department what commodities and/or services your company can provide. It should be emphasized that public bids are posted on the County’s website every Friday and it is your responsibility to frequent this site. Q. Can we fax in our quotes? Yes, a facsimile with a signature is an appropriate format for a response to a Request for Quotations. Q. Can we fax in our response to a public bid? No, a faxed copy of your bid is unacceptable. Pursuant to State Law, all bids must be received in a sealed envelope, and publicly opened and read and must contain an original signature on the bid. Q. Are late bids accepted? No, each bid is time stamped and we will not accept late bids. Purchasing is not responsible for any mail service disruptions or the availability of parking for bidders who wait until the last minute to submit their bids. Bidders should make an effort to either mail their bid, allowing extra time for delivery, or allow time to find parking if they plan to bring it in for the bid opening. Q. May I send a check for the public works bid specifications after I receive them in the mail? No, county policy requires that the check be in the county’s possession at the time the bid specifications are released. For this reason, a faxed copy of your check is not acceptable. For your convenience, the County accepts both MasterCard or VISA to pay the specification deposit. What is the difference between a purchase contract and a public works contract? A purchase contract applies to the procurement of commodities (e.g., equipment, material, supplies) and public work refers to contracts consisting primarily of labor and construction. The public bidding limits is $10,000 and $20,000 respectively. Q. Is my spec deposit refundable? Specifications deposits are returned only to those prospective bidders who submit bids to the county and have returned their specifications unmarked and in good condition within 30 days of the bid award. If you return the specifications in good condition and unmarked at least seven (7) days prior to the bid opening. Q. Can anyone other than county departments buy off county contracts? Yes, bid specifications with the other agencies clause requires the winning bidder to honor the prices, terms and conditions of this contract with any and all municipalities, school districts, fire districts and other district or public authority within Monroe County. Contracts that eligible agencies may use are included in our contract section. Get as much information as possible about the signs of elder abuse and compare this with the situation you are observing. Ask questions of the alleged victim, in a respectful, but direct manner. It is recommended, and may be necessary, to interview the older person privately, without the alleged perpetrator present. Serve your community. Election Inspectors are the people that make Election Day really happen. Our country has asked everyone to chip in and take an active role in protecting our freedoms. The right to vote is one of the oldest and most important entitlements. With those rights come responsibilities. Free and open elections are the basis on which this country was formed and you can make a difference by becoming an Election Inspector to help protect those freedoms. Q. Are Election Inspectors Volunteers? No, the county pays them. Election Inspectors are required to work the entire length of the election day and are relieved for breaks and meals. You may call for more information. Yes, Election Inspectors should take time off during the day to eat a meal and to vote. They may leave their site with at least one of each party remaining. Call the Board of Elections at 585 753-1550 or complete the attached form(coming soon). We can answer additional questions and put you in touch with the Coordinator in your area who is actively recruiting Election Inspectors. Health Insurance—Did You Ever Wonder? Q. I have Medicare and my ex-employer provides a supplement. Do I need a Medigap policy? Probably not. Check the coverage your supplement provides. Are there any areas you feel could be better covered by a Medigap or an HMO program? Compare the cost to you for both options. Beware! If you leave your ex-employer’s coverage you probably will not be allowed to re-enroll later. Q. Where can I find prescription drug coverage? This is not a Medicare benefit, however, some Medigaps and HMOs offer a degree of coverage. Also, many New Yorkers qualify for New York State’s Elderly Pharmaceutical Insurance Coverage (EPIC) program. Q. I'll be 65 in three months and just received a Medicare card. Part A will cost me nothing, but I'll have to pay a premium for Part B. What will Part B do for me? Part B covers a wide range of services and supplies, however, probably the most important coverage is the help with doctor bills. The medically necessary services of a Medicare certified doctor are covered no matter where you receive them within the United States, whether at home, in the doctor’s office, in a clinic, nursing home or hospital. Q. I'm going to work beyond age 65 and my employer will continue providing health insurance. Should I accept Medicare Part B? If there are 20 or more employees, your employer will have to offer you the same coverage provided to the under age 65 employees. If you take Medicare Part B, it will be the secondary payor and the residual benefit may not be worth the cost of Part B. It’s your decision. If you choose not to take Part B be sure to contact the Social Security Office as soon as you become aware that you will no longer be eligible for your employer’s coverage. If you wait until a later time to enroll in Part B you'll be penalized a 10% increase in your Part B premium for every year you could have taken it and didn't. Q. My doctor submits claims to Medicare but does not send the balance to Blue Cross/Blue Shield for consideration. Can you help me? Yes! We can help. The Monroe County Office for the Aging sponsors a program called Health Insurance, Information, Counseling and Assistance Program (HIICAP). HIICAP has trained volunteers who can assist with claims filing, initiating appeals, explaining coverage, assisting with comparisons of insurance options, and many other concerns related to HMOs, Medicare, Medigaps, Long Term Care Insurance, etc. If you'd like to discuss any of the above questions, or have other questions related to seniors’ health insurance, call the HIICAP Hotline at the Monroe County Office for the Aging at 585 274-6292. For copies of a Health Care Proxy and instruction sheet, contact Eldersource at 585 325-2800 (Proxies only). Q. What is the household hazardous waste program? Q. Who can participate and how? The free portion of this program is open ONLY to Monroe County residents with non-industrial household chemicals. To ensure safety and better serve customers, items are accepted by appointment only. Appointments are scheduled online only. After an appointment is made, you will be e-mailed directions to the HHW facility and instructions for the safe packaging and transportation of your items. Under a separate fee-based program, businesses, out-of-county residents and Monroe County households that have somehow acquired industrial-use products may click here for disposal information. Q. What can you bring? Monroe County residents can bring up to 30 gallons of liquid and 75 pounds of solid HHW per appointment without charge. No 55-gallon drums will be accepted. Q. What are acceptable items? Q. What are not acceptable items? Q. What is the location for drop-off? Q. What are some ways that I can minimize potential health problems from household products? Always read the labels of the products that you are considering buying. Note the product ingredients and beware of any warnings of its use. Always use household products only for their intended purpose and according to the manufacturer’s instructions. Use the product in a well-ventilated area. Choose products that are packaged to reduce the chances of spills, leaks and child tampering. Keep household products in their original containers so that safety information and directions for use are always with the product. NOTE: Some products may be labeled “environmentally safe,” but any product that evaporates into the air has the potential to be an indoor air pollutant, depending on the quantity used, the method of use, the products toxicity and the sensitivity of the user. Q. What are some of the health effects of organic chemicals? The ability of organic chemicals to cause health effects varies greatly—from those that are highly toxic, to those with no known health effect. As with other pollutants, the extent and nature of the health effect will depend on many factors including level of exposure and length of time exposed. Eye irritation, headaches, dizziness, visual disorders and memory impairment are among the immediate symptoms that some people have experienced soon after exposure. Long-term exposure can cause loss of coordination; nausea; and damage to the liver, kidneys and the central nervous system. Many organic chemicals are known to cause cancer in animals; some are suspected of causing or are known to cause cancer in humans. Q. What are the particular household product ingredients that I should be concerned about? The products to watch are those containing volatile organic compounds (i.e., petroleum distillates, mineral spirits, toluene, xylene) which are organic compounds that easily evaporate into the air. Some may be flammable while other can be a hazard if they are used improperly. Some of the ingredients not specifically listed or listed as “inert” may also have some unhealthful side effects. People using products containing organic chemicals can expose themselves and others to very high pollutant levels, and elevated concentrations can persist in the air long after the activity is complete. Q. What are some of the household products that I should be concerned about? and some cleaners, degreasers and disinfectants. Please click here for FAQs regarding Human Resources. In 1999, New York State enacted legislation that provides for court-ordered assisted outpatient treatment (AOT) for certain people with mental illness who, in view of their treatment history and present circumstances, are unlikely to survive safely in the community without supervision. This legislation is commonly referred to as Kendra’s Law. The Monroe County Office of Mental Health assumed the responsibility for the operation of the AOT program in Monroe County. Q. Who may be affected by Kendra’s Law? will likely benefit from AOT. Before a court may order AOT, it must be satisfied that AOT is the least restrictive alternative for the person. Thus, if a less restrictive program or treatment exists that could effectively deal with the person’s mental illness, the court will not issue an order for assisted outpatient treatment. Q. What is the process to get AOT for someone? a parole or probation officer assigned to supervise the person. People authorized to file petitions should contact the AOT program at 585-428-4530. The AOT program will send an information packet regarding the law, petition process, information/documentation requirements and necessary forms for the petition process. The petitioner should review this information and if they decide to move forward, they should re-contact the AOT program to begin the process. Q. What is the AOT petition process? Upon receiving a request for a petition the AOT program will work with the petitioner to determine if there are potential community-based service alternatives to AOT. If the petitioner decides to move forward with the filing, the AOT program will determine if the individual meets the criteria for AOT and will make arrangements for the next steps in the process. The petition, which is a formal statement of facts demonstrating that the person meets the criteria for AOT, must be accompanied by the affidavit of an examining physician. The AOT program will make arrangements for the physician examination. The affidavit must show that the physician examined the person within 10 days of the filing of the petition, and that he or she meets the criteria for AOT. If the subject of the petition has refused examination, the physician’s affidavit must state that attempts at examination were made and that the physician believes the individual meets the AOT criteria. Several other procedural forms must also be filed, which will provided by the AOT program. Once the petition is filed with the court, copies must also be served on the person who is the subject of the petition, Mental Hygiene Legal Services, any health care agent appointed by the person in a health care proxy, if known, the State Office of Mental Health and the Director of the County Office of Mental Health. The court is required to set a hearing date that is no more than 3 days after the court receives the petition (the hearing may be adjourned to a later date if the court finds good cause for doing so). At the hearing, the court will hear testimony of the physician whose affidavit was filed with the petition, and may also consider testimony of the petitioner and the subject of the petition. Other forms of admissible evidence may be considered as well. If the court determines by clear and convincing evidence that the criteria for AOT are met, and a written treatment plan has been filed with the court, an order for assisted outpatient treatment is issued. The court order is directed to both the person receiving AOT and the director of the AOT program. The court will require the person to accept the treatment deemed necessary by the court, and will require the AOT Director to furnish such treatment. In Monroe County, court-ordered services are provided by community mental health agencies. The individual will also be assigned to an Intensive Case Manager or the Assertive Community Treatment Team to assist the individual in adhering to the treatment plan. The initial court order is effective for up to 6 months from the date of the order. The order can be extended for successive periods of up to 1 year each, but any application to extend AOT requires a showing that the person continues to meet all of the AOT criteria. Q. What happens if the person does not comply with the terms of the court order? Non-compliance will be addressed on an individual basis. The AOT program, in consultation with the treating physician and the ICM/ACT team, will determine appropriate steps to address non-compliance. This may involve closer monitoring, modifications to the treatment plan (which would require that a material change to the AOT order be obtained through the court) or involuntary hospitalization. If a physician determines that the person may need involuntary admission to a hospital, the physician may recommend that the person be transported to a hospital and retained for up to 72 hours to determine if inpatient care and treatment are necessary. Any refusal of the person to take prescribed medications, or the failure of a test to determine either medication compliance or alcohol or drug use, may be considered by the physician in reaching the clinical determination regarding involuntary admission. Any decision to retain the person beyond the initial 72 hours must be in accordance with the procedures for involuntary admission set forth in Mental Hygiene Law. Q. I have a question on the Lemon Law? Call the New York State Attorney General’s Office at 585 546-7430. Q. Who can I contact to register a complaint against my attorney? Call the Monroe County Bar Association – 585-546-1817. Q. I need the phone number for Small Claims Court. Q. I need the phone number for Monroe County Legal Assistance. Q. I need the phone number for the Monroe County Bar Association. Q. Can you check to see if a person has been arrested? Questions regarding prisoners should be directed to the Sheriff’s Department. Q. Have a legal question or requesting an attorney for a personal matter and would like to speak to an attorney? The Law Department is not allowed to answer these types of legal questions as they are strictly attorneys for their one client - Monroe County. Call the Monroe County Bar Association 585 546-1817. Q. Can you check to see if there is a local law on a certain subject? All local laws are included in the Monroe County Charter or you may contact the Monroe County Legislature’s Office at 585 428-5350. Q. Can you give me the current amount I owe on my MC taxes? Call the Monroe County Treasurer’s Office. Q. I want information regarding the County’s In Rem Foreclosure? The law firm of Phillips Lytle LLP now handles these matters. You may call them at 585 238-2000. Q. I want information on the foreclosed property and other property that is being auctioned off in the COB lobby? Q. Where do I get information about Family Health Plus, Child Health Plus, Women-Infant-Children, or Prenatal Care Assistance Program? Check out the information about Family Health Plus (FHP), Child Health Plus (CHP), Women-Infant-Children (WIC) or the Prenatal Care Assistance Program. Learn more at New York State Department of Health–Consumer Info. Q. Where do I get information about the New York State Partnership for Long Term Care? For information about the New York State Partnership for Long Term Care visit their website. Learn more at NYS Partnership for Long Term Care. Q. Where do I call for an application for Family Health Plus or Child Health Plus? To request an application or an appointment for Family Health Plus or Child Health Plus, please call 585 530-4215. Q. Where do I call for information about home care services? For information about Medicaid home care services programs, please call 585 753-6563. Q. Where do I call for information about Medicaid managed care programs? For information about Medicaid managed care programs, please call 585 464-6402. To apply for Medicaid, call 585 753-6960 and an application will be mailed to you. Or, you may pick up an application from the Monroe County Department of Social Services waiting room at 111 Westfall Rd., Rochester, NY. Q. How do I order Medicaid transportation to a medical appointment? If you are a Monroe County Medicaid recipient, you may call 585 288-4680 (Medical Motor Service) to request transportation to medical appointments. Q. How do I report Medicaid Provider or Consumer Fraud? To report provider or consumer fraud, you may call 1-877-87FRAUD (1-877-873-7283). Q: How does the Monroe County Prescription Discount Card work? A: Just present this FREE card to your pharmacist the next time you bring in a new prescription, or go for a refill. Q: Where can I use my Monroe County Prescription Discount Card? A: The card is accepted by most pharmacies in Monroe County, including Wegmans, Tops, CVS, Eckerd, Rite Aid, Target, and Wal-Mart. For more information on over 55,000 participating pharmacies nationwide, please call ProAct toll free at 1-877-776-2285 or visit www.NYRxDiscountCard.com. Q: What does the Monroe County Prescription Discount Card cover? A: All prescription medications are covered, at a discount rate. Savings are also available on Vision, Lasik, and Hearing services. For more information on discounts, please visit www.NYRxDiscountCard.com. Q: Can I use my card to get prescriptions through the mail? A: Yes, the card allows for a 90-day supply at Health Direct Pharmacy Services. For more information, please call 1-866-287-9885. Q: Can I use the card if my prescriptions are already covered by insurance? A: No. This card is intended to be used if you don’t have insurance, or if something is not covered by your current program. It can’t be used to discount prescription co-payments or deductible charges. Q. 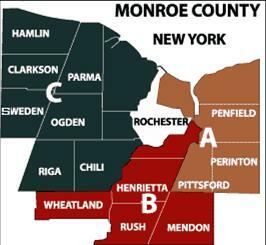 Where is the Monroe County Sheriff’s Office located? The Sheriff’s Headquarters is located in the Monroe County Public Safety Building on the Civic Center Plaza, 130 South Plymouth Avenue, Rochester, New York 14614. Our phone number is 585 753-4178. Q. What zone am I in? The Neighborhood Zone Map (above) shows which towns and villages are in each of the three zones. Click here to find out which zone you live in. Q. What number do I call in case of an emergency? Q. Does the Sheriff’s Office offer fingerprinting services? Fingerprinting services are available for all County residents for employment and pistol permit applications at the Sheriff's Central Records Unit. Times: Monday-Thursday, 10:00 a.m. to 1:00 p.m and 2:00 p.m. to 7:00 p.m.; and Friday, 10:00 a.m. to 12:00 p.m. and 1:00 p.m. to 4:00 p.m. There is a $25.00 fee for fingerprints. Q. How do I obtain a pistol permit? Applications for pistol permits are only available through the Monroe County Clerk's Office at 39 West Main Street, Rochester, New York 14614. Visit the Monroe County Clerk's Office for more information. Q. I receive calls from solicitors requesting donations for various police related associations. Are these legitimate? Should I donate? The Monroe County Sheriff's Office does not solicit over the telephone. Calls for other law enforcement agencies are generally done by telemarketing firms. If you decide to contribute to any of the organizations, always ask for the name, address and telephone number so that you may call back after careful consideration. Donations may be made to the Monroe County Sheriff's Office through the Monroe County Sheriff's Foundation. Founded in 1991, the Monroe County Sheriff's Foundation, a non-profit organization, funds special Sheriff's Office projects, education and programs that cannot be realized with county funding alone. For more information visit the Monroe County Sheriff’s Foundation page. Q. How do I formally recognize or make a complaint concerning an employee of the Sheriff’s Office? The Monroe County Sheriff's Office is recognized as one of the finest in the nation. Continual feedback from the citizens it serves is vital to improving all aspects of the Sheriff's Office. We encourage your comments and suggestions. To formally recognize an employee you may contact his/her Supervisor or Command Officer by telephone at 585 753-4178. You may write the Sheriff or Undersheriff directly. You may file a complaint at any time by calling (585) 753-4178 or 911 and request a Sheriff's Supervisor or Command Officer contact you at your location. You may contact Internal affairs by calling (585) 753-4519, Monday through Friday, 9am - 5pm. You may also write the Sheriff, Undersheriff or Internal Affairs directly. Q. What information do I need for personal property levies? A specific and detailed list of assets or the property upon which we will levy. VIN numbers for vehicles and equipment. Serial numbers, color, make or model. Any other combination of identifiers that would assist us in making our levy. You may also be requested to supply someone to accompany the Sheriff to assist with property identification. Q. What information do I need for an income execution? You must also provide the full correct name and address of the employer. Q. When may I anticipate checks on collection accounts? Once an execution is working, we issue bi-weekly checks on all accounts once certain funds to be disbursed are cleared at the bank. Note: The Notary Public Examination is a Walk-in Exam. Q. Is there an exam fee? Yes, there is a $15 fee for each exam you take. You may pay by check or money order made payable to the Department of State or charge the fee to MasterCard or Visa. Cash will not be accepted. A $20 fee will be charged for any check that is returned for insufficient funds. Application and exam fees are non-refundable. Q. What are the eligibility requirements for a commission? You must be at least 18 years of age at the time you apply. Nonresidents (including attorneys admitted to practice in New York State) must have an office or a place of business within the state to become a Notary Public. Q. What are the regulations and procedures at the test center? You must bring a photo ID card to the test center on the day of your exam to verify your identity. If you do not have a photo ID, you will not be admitted. For security reasons, all applicants are thumb printed prior to taking the exam. Be early. Give yourself some time before the exam. You should report to the test center at least 15 minutes prior to the starting time because seats are assigned on a first-come/first-served basis. We cannot guarantee that enough space will be available to accommodate everyone who arrives. Bring acceptable supplies. You should bring two no. 2 pencils to the exam. You cannot use study or reference material during the exam. You will be given a maximum time limit of 1 hour to take this exam. Note: Examination proctors may, at their discretion, dismiss from the test center any person who is found cheating or engaging in practices contrary to the rules and regulations of proper examination conduct. Q. What type of examination is given? The written exam is multiple choice. You will mark your answer by filling in circles (o) on a machine-readable score sheet. Exam topics include: law, general terms and information related to the duties and functions of a notary public, as outlined in the Notary Public License Law booklet available from the County Clerk’s Office or the Division of Licensing Services. Q. What is a passing score? You must correctly answer at least 70 percent of the questions to pass the exam. However, we report all exam results as either passed or failed; you will not get a numerical score. Q. When and how do I get my exam results? We will notify you by mail as soon as your exam results are available. Results will not be given over the telephone, so please do not call Licensing Services for them. Note: Failure to apply for a commission within two years of the date of the examination will invalidate the results. Applicants who fail will receive a notice in the mail. They may retake the written exam on a date and time of their choice. Exam schedules are updated twice a year. Q. Where are the test sites and what are the times? Test sites and times are subject to change and exams may be canceled due to weather conditions or other emergencies. If hazardous weather conditions exist in your area, you may call 518 474-4429 to see if an exam has been canceled. Please do not call the test centers listed below. If you need assistance or exam information, you may contact a Division of Licensing Services office in your area or call the Albany phone center at 518 474-4429. TDD users may contact the New York State relay operator at 1 800-662-1220. Exams are scheduled every Tuesday, at 11:00 a.m. and 1:30 p.m. in Buffalo and Syracuse and EVERY WEDNESDAY, at 9:30 a.m. and 11:00 a.m. in Albany, Franklin Square, Hauppauge, New York City and Rochester. Exams are scheduled on Tuesdays at 11:00 a.m. and 1:30 p.m. in Binghamton, Newburg and Utica on January 4 & 25; February 8 & 15; March 8 & 22; April 12 & 26; May 10 & 24; and June 7 & 21. Exams are scheduled on Tuesdays at 1:30 p.m. in Plattsburg and Watertown on January 11; March 8 and May 17. Exams are scheduled on Fridays in Westchester on March 25 at 1:30 p.m. and June 24 at 8:30 a.m.
Rochester Finger Lakes DDSO, 620 Westfall Road—Take Thruway to Exit 46, take 390 North to Exit 16, turn right on East Henrietta Road, turn right at second traffic light onto Westfall Road, Finger Lakes DDSO is on left. Park in lot on right and enter building through main lobby. Note: Remember the $15 exam fee, arrive early and bring your photo ID and two no. 2 pencils. See the New York State Notary Public License Law for more information. Person in Need of Supervision (PINS) is a term used to describe youth with serious behavior problems who come to the attention of the Juvenile Justice System. The Family Court Act (Article 7) contains laws which determine how PINS cases must be handled. Q. Who is a PINS? Youth under the age of eighteen who show a pattern of disobedience, running away, curfew violations, drug or alcohol abuse, violent behavior or severe school truancy. Q. What can the PINS process do? Youth who exhibit such behavior may receive from probation assessment, supervision, counseling, evaluation, advocacy, respite housing, or other services—often free of charge. Diversion services are required in most cases. The PINS process works primarily with cases which have already tried other services in the community. Q. Who can bring a complaint? Most PINS complaints are made by the parents or school districts. To make a complaint you must have specific charges, including information on when the behavior occurred. You do not need police reports but may need school attendance records. Q. Want to find out more? A Probation Officer is available to accept telephone inquiries or return calls daily, Monday through Friday. The officer will discuss the situation, make referrals, or schedule appointments. Ask for Preliminary Intake Review (PIR). Q. What can I expect at Probation? All PINS cases must be reviewed by Probation Intake; first to ensure that they are eligible for service, then for assessment and planning. The process may take two to three hours and includes a complete family history. In some cases probation will ask that your child be seen for other evaluations. Probation Intake can supervise cases for up to six months. Q. Can I use a PINS to prevent problems with my teenager? No. Cases cannot be accepted unless a pattern of behavior already exists. Threats to run away or not attend school are not grounds for a PINS. Q. Can I just walk in? Cases are seen by appointment only! If there is an emergency you will be seen quickly, but we first need to review each case by telephone to be sure you bring the required documents and there is an officer available to help you. Q. Must I bring my child? The law requires that both parent and child be seen at probation. You cannot begin this process in secret. If your child is missing from home or refuses to come with you, call probation for instructions on how to proceed. Q. What do I do if my child runs away? You should begin by calling 911 to file a missing person report. There is no waiting period for reporting children missing. If your child has a history of running away, has been gone several days, or is refusing to return home you may need to request a warrant to allow police the authority to locate and hold your child. In these cases you should call probation after filing the missing person report. Q. Do PINS cases go to court? Most PINS cases are resolved at Probation and do not go to court. The law requires that every effort be made to avoid court. Severe cases which go to court may be given a warning and rules by the judge and returned to Probation for services; be placed on probation supervision for one year; or, placed out of the home. If a case does go to court, the law requires both parents be notified, even if they do not live together. The assistance of an attorney is not required to bring a complaint. Probation will assist parents with initial paperwork if court involvement is necessary. Q. Will my child be placed? Probation and the court are required to make every attempt to keep families together and avoid placement. The majority of cases do not result in placement. Q. If my child is placed, who pays? Parents are responsible for the financial support of minor children. If your child is placed by Family Court, you will be required to pay an amount based on your income. The law requires that both parents and step-parents share in the cost of placement. Q. How Do I Apply for Temporary Assistance? To Apply: Phone 585 753-6960 to request to have an application mailed to you or you can stop at any of our offices and pick up an application. The Financial Assistance Division receives over 40,000 applications yearly. Applicants are scheduled to attend an Information Session about the application process and the applicants’ responsibilities. Applicants are required to look for work throughout the application process as well as pursue any other potential benefits such as Social Security and child support. Q. What is Meant by “Work First”? “Work First” is the phrase used to convey the primary goals for applicants and recipients ... To consider work their first priority. “Work First” is based on the idea that finding a job and earning a paycheck is the best way for families to become self-sufficient. The responsibility of this office and our partners in the community is to support work and help families overcome barriers. For job search assistance visit RochesterWorks! (585 258-3500) at 34 St. Paul Street. Q. When I Work, Can I Still Get Temporary Assistance? Yes! Partial benefits are available to families depending upon how much is earned. There are over 2,000 Temporary Assistance families who work and receive partial cash benefits and food stamps. DSS will also pay for child care. Q. What Benefits Are Available When It Ends? If you have children, you will still be eligible for Medicaid and Child Care. All child support collected will now go directly to you. Many families who leave Temporary Assistance will still be eligible for Food Stamps. Q. What is the Earned Income Tax Credit? The Earned Income Credit is a special tax benefit for people who work full or part-time. Even if you don’t owe income tax, you can get the credit. But, you must file a federal tax return. New York State also has an Earned Income Tax Credit. Q. How do I contact the director of the Department of Transportation? Businesses, Community Service Groups, Churches, Alumni Clubs, Government Agencies, Professional Associations, Radio Stations, Hospitals, Neighborhood Organizations and others can all ADOPT-A-HIGHWAY! Q. What do you need to participate in ADOPT-A-HIGHWAY? All that is needed to ADOPT-A-HIGHWAY is the commitment of a minimum of ten volunteers, General liability insurance, basic yard tools and the desire to improve your community. Q. Why your group should join the ADOPT-A-HIGHWAY program? Exposure! Monroe County DOT will install two 3 x 4 highway signs crediting your organization for its efforts. Thousands of motorists a day see these signs. It’s a great group activity. Many participating groups use their clean-up day as an opportunity to hold a post-clean-up picnic or other family event. It’s the environmentally responsible thing to do! Exposure. Monroe County Department of Transportation will install a sign crediting your organization for your efforts. Thousands of motorists a day see these signs, therefore providing you excellent exposure in our community. As you participate in helping our environment, you gain public awareness. Not only is this an environmentally positive action, but also a fun and rewarding group activity for your club, group, or business! Q. What does my group have to do once we sign up? Your group will be responsible for weed control, providing mulch for the bed area and attending to the watering needs of your flowers. Q. What do we need to participate? Individuals committed to the program. Basic yard tools such as rakes, shovels, spades, work gloves, etc. Garden Clubs, Businesses, Churches, Alumni Groups, Government Agencies, Professional Associations, Radio Stations, Hospitals, Neighborhood Organizations, County and State, ADOPT-A-HIGHWAY Groups, Neighborhood Organizations, Service Organizations, etc. Q. What is the difference between a bridge and a culvert? A bridge is a crossing structure equal or greater than 20' in span. Q. What is a bridge deficiency rating? A bridge deficiency rating is a number indicative of the overall condition of a bridge structure. The bridge is rated on a scale of 1 thru 7, with 7 indicating a brand new bridge and 1 a severely deteriorated bridge, that must be closed to traffic. Any bridge with a rating that is lower than 5 is considered deficient. Q. How often are bridges and culverts inspected? By whom? Bridges are inspected every two years by the state and the county. Culverts are inspected by the county every four years. Q. Why do I call the county for problems with traffic signs, signals or pavement markings on City of Rochester streets? The answer to this often asked question is traced back to the year 1970. In an effort to assist the City with their financial problem, the County entered into an agreement with the City. The agreement gave the County ownership and responsibility over all traffic engineering services in the City of Rochester. Therefore, all traffic signs, signals and pavement markings on city streets are installed and maintained by MCDOT. MCDOT also reviews design plans for all city street reconstruction projects. Q. What makes signs and pavement markings appear to glow in the dark? The material or “sheeting” used on traffic signs is Retroreflective. “Retroreflectivity” means that when light strikes the surface, it is reflected back to the source. When your vehicle's headlights shine on a sign, it is reflected back to the driver. The retroreflectivity is caused by tiny spherical glass beads imbedded in the sign sheeting. The same effect for pavement markings is achieved by dropping the tiny glass beads onto the wet paint as it is applied to the surface of the road. Q. What makes the signal change as soon as I pull up to some intersections? Traffic loops. These “loops” are wires buried in the roadway. When a vehicle drives towards an intersection that has a traffic signal, these loops detect the presence of the vehicle and send a message to the control unit of the traffic signal that there is a vehicle approaching. This helps to reduce waiting time for the vehicle and avoids having the signal change if no vehicle is waiting. Q. How can I get traffic count information from the County? Monroe County conducts manual tube counts on each roadway in the City and County on a four year cycle. An annual Highway Count Summary report is produced that provides the latest count information available. This report is distributed to other government agencies, consulting firms, and other interested parties that regularly use such count data. If you need count information for a particular location, contact us. Q. Why do the walk lights provide so little time at many locations? “Walk” or the walking person symbol are intended as the designated time to step off the curb and begin the crossing. Pedestrians must check for conflicting vehicles before taking this first step. It is not intended that the person get all the way across the street on this indication. Flashing “don’t walk” or the flashing hand symbol designates the time that a person who has already started to cross may continue to walk across the intersection. You should not begin crossing at this point, as there may no longer be enough time to get all the way from one side to the other side. However, anyone who began crossing during the “walk” interval has plenty of time to finish the crossing. Solid “don’t walk” or the solid hand symbol designates the time at which no pedestrians should be in the crosswalk. Q. How do you know how long to make the flashing “don't walk” interval? This is timed based on the width you have to walk across. A wider crossing gets more time. The assumed walking speed is four feet per second, which is relatively slow to accommodate those that need some extra time. Q. How do you decide where traffic signals are provided? Traffic signals are the highest level of traffic control and must be used only where they are absolutely necessary. It is important to remember that traffic signals, while a great help to many locations, also come with some disbenefits, such as a possible increase in overall intersection delays and other problems associated with the interruption of traffic (examples include potential increase in certain accident types, added wear and tear on vehicles and pavement, and increased driver frustration). New York State publishes guidelines known as signal warrants that define what constitutes the need for a signal. Some of the many factors considered include vehicular and pedestrian volume, the delays being experienced by side street vehicles, and accident history. The American Red Cross has created a Student Volunteer Directory that is now accessible online. You may contact the American Red Cross for more information at 585 241-4490 or view the directory, Generation Give Back at www.generationgiveback.org. Youth can choose the organization they would like to volunteer for, select the hours they want to work, and keep track of the hours they work right on the website. Our hours are Monday through Friday, 8:00 a.m. until 5:00 p.m.
Rochester Works at 255 N. Goodman Street, Rochester, NY 14607, phone 585 258-3500, will assist youth ages 14–21 with training and tools to help them get jobs. See the quick link to their website below! The student has working papers/work permit. Call 585 428-7300 and ask for the Personnel Office. You can also contact the School to Work Coordinator in the Rochester City School District at each 7–12 grade school. For more employment information, download the Adult Guide to Youth Services (232k PDF) and view page 35. Visit the Rochester Works! website for additional information.